Nobina Robinson accepting her “OMG – Maybe I AM the best person” award at the National Arts Centre on October 18th. You may not recognize her name, but chances are high that you’ve been influenced – if only indirectly – by her informed opinions. Nobina Robinson attended one of our Writing Compelling Commentary workshops in 2012. Since then, she’s authored or co-authored more than three dozen op eds. Her commentary has been published in a wide variety of influential print and online publications across Canada. In the process, she’s changed conversations about, and broadened public appreciation for, the critically important role polytechnics — institutes that offer applied education and training — play in preparing workers to contribute in Canada’s evolving economy. That’s why we celebrated Nobina at an event co-hosted by the Ottawa-based Famous Five organization on the anniversary of the Persons Case. 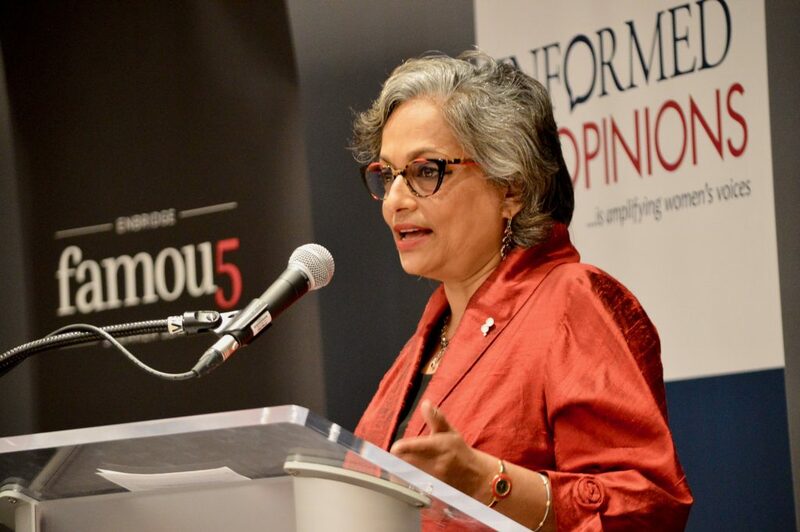 We wanted to publicly salute her significant contribution to Canadian public discourse, and to encourage other women to follow her inspirational example. A short video made for her recent retirement as CEO of Polytechnics Canada makes clear her capacity to inspire. The video features testimonials from the presidents of polytechnic institutions across the country who sum up her character and impact with words like focused and tenacious, fearless and formidable, passionate and influential. They credit her with putting their institutions on the agenda of political decision-makers and changing the conversation about post secondary education in Canada. Little wonder that Algonquin College recently awarded her an honorary degree, or that she’s received appointments from both the CD Howe Institute and the University of Calgary’s School of Public Policy. Here Nobina explains in her own words why engaging with media was important to her. 1. What were you hoping to achieve by writing commentary? Investing time and resources in writing commentary is a key part of smart public policy advocacy, particularly given the proliferation of new media platforms for getting the message out. My aim was to successfully break the dominant narrative in Canadian policy circles whereby most commentators argue that only a university education or degree, and only university research and basic science are key to the skills and innovation challenges of our country. Given the significant role polytechnic grads play in today’s economy, I wanted to make the case that Canadian higher education and innovation systems need to harness a diversity of educational programs for the country’s growth. I wanted to broaden how we conceive of talent to include technicians, technologists, apprentices and non-traditional learners. 2. What kind of response did your commentaries generate? Understandably, members of my organization were pleased and even surprised at the kind of access to media pages we began to get. The recognition and positive response from the very decision-makers we were trying to influence was even more surprising and gratifying. The best response was when other journalists picked up on the written commentaries and asked to interview me, generating the kind of “earned media” that positions you as a credible expert on the issues you’re addressing. 3. What, if anything, surprised you about the experience? Two things. One, I had to learn the difference between promotion and expert commentary, leading to an appreciation of the more subtle ways in which written analyses must function in order to be effective advocacy. Crafting evidence-based, persuasive arguments and publishing them in influential media is more compelling than many more traditional lobbying activities. Also, I didn’t realize how limited the knowledge base would be among general reporters regarding issues such as science funding, innovation lag, skills shortage, career bias and higher education. I often had to become better about slowing down, backing up, and offering context to brief the reporter on background, before moving to the formal part of the interview to share information relevant to the particular issue for quotation purposes. 4. What advice can you offer to other women who may still be reluctant to engage with media? Just do it. But do it with purpose, with clarity and with an appreciation for the media’s own constraints (word limits, deadlines, limited understanding of the issues you’re writing about). No writing is wasted, no draft is useless. Keep all versions, and enjoy watching your ideas and commentary take shape. If you don’t enjoy it, if you treat commentary as an obligation or a chore, your words will not shine. 5. Any other thoughts about sharing your informed opinions through media that might be useful for other women? The mission of Informed Opinions is so essential and so focused – amplifying the voice of women commentators means strengthening democracy. I never thought I was doing such a laudable/high-minded thing, but now I know that quality public writing – on any subject – at a time of so much noise, is vital. Secondly, there is a network to help those who may be shy in making their expertise known – from attending workshops, to accessing free online resources, to receiving advice on how to navigate engaging with media engagement… Informed Opinions offers strength in growing numbers of women experts; the organization is an energizer that we should all use more often, and support constantly. Informed Opinions is enormously grateful to Nobina for not only her generous words about, and support for our work, but also for her enthusiastic embrace of media. We are deeply honoured to call her an Informed Opinions’ “graduate”, a member of our experts database, and a valuable ally.